Acne severity correlates with increased anxiety, anger, and other negative psychological consequences. Menstruation, pregnancy, and hyperandrogenic states can exacerbate acne. Retinoids and retinoid-analogs prevent development of the microcomedo and comprise reasonable first-line agents. A topical retinoid combined with an antibiotic (either topical or oral) yields greater and faster results than either used alone. The first step in the formation of acne is the development of the microcomedo.12 Normally, keratinocytes that line the follicular opening are shed into the lumen of the pilosebaceous unit and excreted. Comedone formation occurs when increased cohesiveness prevents the shedding of keratinocytes, and they accumulate in the opening, leading to hyperkeratosis. Increased production of follicular keratinocytes also occurs. These cells, along with lipids and other cellular elements, create a plug in the follicular opening. With time, lipids, cellular debris, and bacteria (Propionibacterium acnes) accumulate behind the comedone and form a clinically apparent lesion. Open comedones (blackheads) are flat or dome-shaped papules with a dilated follicular orifice filled with black-colored (oxidized) keratin. Closed comedones (whiteheads) are more subtle and present as small, pale or flesh-colored papules with no apparent follicular orifice or erythema. Comedones may become secondarily inflamed if squeezed, picked, or scratched. Inflammatory lesions include erythematous papules, pustules, or nodules (Figure 1). Acne vulgaris occurs primarily on the face and, to a lesser degree, on the upper chest, back, and shoulders. Hormones can influence the course of acne. In one study, almost half of adult females had premenstrual flares of acne.13 Many women experience their first flare of acne or worsening of existent acne with pregnancy. Conditions in which patients are exposed to excess androgens, whether endogenous or exogenous, are conducive to the development of acne. The clinical presentation of acne vulgaris typically renders a straightforward diagnosis. The age of the patient and the morphology and distribution of lesions are often characteristic. Severity can range from mild to moderate (Figure 2) to severe (Figure 3). Rarely, a biopsy may be required for a firm diagnosis. The differential diagnosis for acne is quite broad. 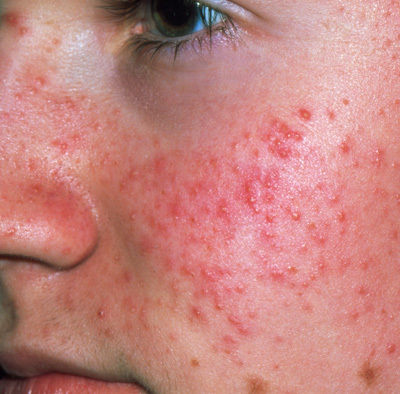 Acne rosacea can be similar to acne vulgaris with papulopustules and erythema on the face, especially the nose and cheeks. Perioral dermatitis is characterized by small papules and vesiculopustules on an erythematous base with scale that closely follows the border of the lips and, occasionally, the paranasal and periorbital regions. Gram-negative folliculitis is characterized by numerous superficial pustules or deep-seated nodules. Pseudofolliculitis barbae should be considered in African-American patients, especially men presenting with inflammatory papules and/or pustules of the beard area (Figure 4). Acne keloidalis nuchae, most common in African Americans, presents with persistent inflammatory papules and pustules over the occipital scalp and posterior neck. In patients with HIV/AIDS, eosinophilic pustular folliculitis should be considered in the differential diagnosis of acne. It presents as recurrent, pruritic, follicular papules and pustules on the face, neck, trunk, and proximal extremities. Several disorders of follicular keratinization exist and can present on the face. Keratosis pilaris on the face can mimic acne vulgaris. Keratosis pilaris atrophicans faciei is characterized by erythema and small, horny, follicular plugs on the cheeks, temples, and forehead. Acneiform eruptions can be caused by many medications, most commonly corticosteroids, anabolic steroids, isoniazid, phenytoin, lithium, bromides, and iodides. Generally, this eruption is monomorphous and consists of inflammatory papules and pustules. Acne cosmetica, the result of comedogenic cosmetics, presents with closed comedones and papulopustules mainly on the cheeks and chin. Discontinuing the offending agent usually allows resolution. Chloracne, caused by chlorinated aromatic hydrocarbons, presents with small cystic papules and nodules on the malar, retroauricular, and mandibular regions of the head and neck. Acne mechanica results from mechanical forces (rubbing) causing occlusion of the pilosebaceous orifice. Helmets, chin straps, violins, and collars are among the implicated objects. Acne excoriée refers to patients with or without mild acne who scratch and pick their faces and leave small eroded, crusted lesions.